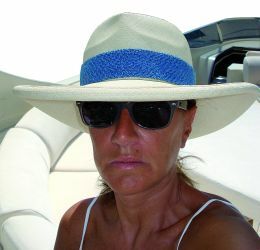 Giuliana Longo was born in Venice in a family that has been producing hats for generations. Mrs Longo takes part in the "Hat Italian Style" project promoted by the ministry of commerce and Confindustria, the Italian industrial association. 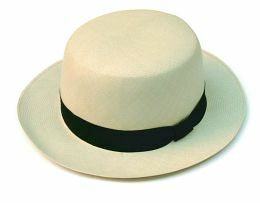 Luchino Visconti in his film "Death in Venice" had "Tadzio" wear a "Montecristi." Gregory Peck sported one in "Darkness over the Fence." Sean Connery had a Panama hat on in at least two films, one was in "A Just Cause" and the other was in "Indiana Jones". Churchill held Panamas in great esteem and a particular model takes his name. As may be understood by the examples used, Panamas are hats that make people dream and to discover their story and secrets, I spoke to Giuliana Longo a fashion designer "en tˆte" and expert importer of Panamas from Equador. Mrs Longo, I'd like to ask you the origin of Panama hats and if in any way its linked to the sea? Panamas are the sea! The best products come from Montecristi in Pile's enclave. During the Panama Canal's construction, workers wore a hat which as of then has been called a "Panama." Some engineers involved in the endeavour appreciated its qualities and usefulness and thought of introducing it to Europe. Despite the hat's humble origins this fact contributed to its outstanding success. Above all I mean its lightweight, flexibility and finally its characteristic shape that foresees a high forehead which acts as an air chamber against oppressive heat. What is also very important is the shape and size of the hat-brim which in some examples may be folded upwards. The Panama quickly attained success in Europe. We just have to recall that in 1870 at the inauguration of a worldwide exhibit in Paris, a Royal member sported one in public for the first time and I'm referring to Napolean III. As of that instance the Panama became a good of luxury. What is the difference between an ordinary Panama and a luxurious one? The secret lies in the quality of the craftsman's hand work. There is a market for those who don't want to spend a lot, yet, at the same time, there is a parallel market for a luxury Panama which is a yachtsman's dream. The sumptuous type can weigh as much as only 30grams, be as lucent as satin and take up to eight months to weave it. I should be receiving an example of this kind in a few days, a "Montecristi" a very fine one which takes about five months to produce moreover with the owner's name written in the interweave. What can you tell us about their pricing? A standard price is 45 euros but for an extra lightweight one, 4000 euros may be easily reached. Michael Jordan, the basketball player, has a 10,000 euro Panama which is particular for the brim's width and decorations in silver. A well known Swiss publisher owns a 3,500 euro "plantation" with a large upturned brim. A famous British gourmet has a splendid collection of seven Panamas. Mrs Longo, you are referred to in Paris as "madame chapeau" and you're an artist in your own field, how would you define that touch which makes a Panama a luxury product? A luxury product has to be exclusive to be one. A little like with a Ferrari, you can't have it immediately just because you have a lot of money, you have to dream of it, suffer in waiting, long for it, cue with other connoisseurs to have at last your unique model. Luxury meant as a final result of a process of quality, I believe is the result of its author's culture and history. Has the workmanship changed today from the past? No it hasn't the handiwork is identical to the one passed on through centuries from the pre-Colombian era. The material is the same too and derives from the "Toquilla Bombanaxa" palm which was later translated by the Spaniards into "Carlo Ludovica Palmata." One of the many signs of the destruction of the natives' culture. The palms' buds are cut, boiled for two days, whitened with sulphur, frayed and exsiccated in the wind of the Pacific Ocean. 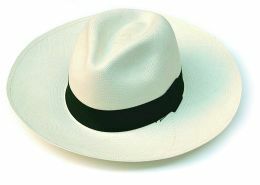 As far as the "Montecristis" are concerned the bales of straw stay in the manufacturing area whereas "Cuencas" take the route of the Andes to Cuenca, in fact, which is the largest hat manufacturing area. "Montecristi" and "Cuenca" what is their difference? The difference between owning a "Montecristi" and a "Cuenca" is abyssal. Aside from the thinness of their weave the sensation that the two types of hats transmit is completely different. With a "Montecristi" on your head you become all in one with the Pacific Ocean: the sand, salt and the Ocean's magic become part of you. How are the Panamas distributed commercially? Loads full leave from Guayaquill for America and Europe reaching those distributors that always have a contact as point of reference in Ecuador. Distribution however is for a few. I personally go to collect my Panamas and I offer them to my clients from all over the world in my atelier in Venice.